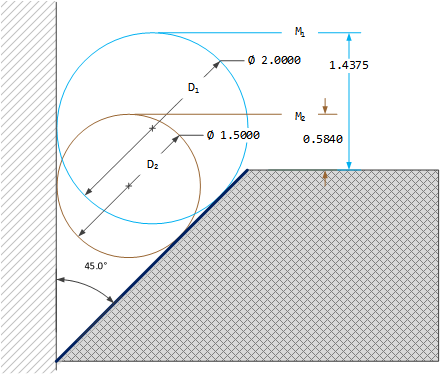 Figure 1: Chamfer Angle Measurement Example Using Two Gage Balls. One metrology operation I have had to perform a number of times is measuring a chamfer angle precisely – Figure 1 shows today's example. Many items are chamfered – even in electronics. For example, edge connectors on printed circuit boards often need to be chamfered to ensure that they do not damage the connectors they are being inserted into. Referring to Figure 1, you might think that chamfer measurements would be easy because you have a vertical edge and horizontal edge that you should be able to measure. Unfortunately, these edges are rarely straight. They often are rounded or irregular. This makes the chamfer angle measurement non-repeatable. Using gage balls eliminates any dependence on the determining precisely the location of an edge. Equation 1 is the formula I use for determining a chamfer angle using two gage balls of different diameter. M1 is height measurement of ball 1 above the top surface. M2 is height measurement of ball 2 above the top surface. R1 is the radius of gage ball 1. R2 is the radius of gage ball 2. I derive Equation 1 in the analysis section. Figure 2 shows the variables that I defined for the angle measurement scenario of Figure 1. I am lazy this morning. I am sure there is a clever geometric derivation, but the quickest way to get a formula is to use Mathcad's symbolic processor to solve a simple system of equations. Figure 3 shows my derivation with Q = arctan(θ/2). I often initially do my trigonometric derivations sans trig functions because Mathcad will often generate overly complex answers, e.g. 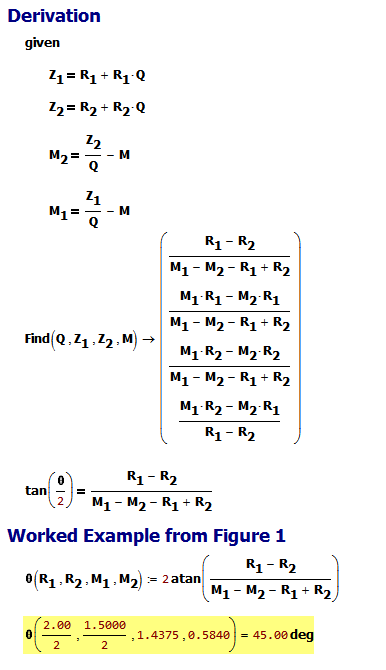 applying half-angle formulas to solve for θ. As an example, I use Equation 1 to determine the angle in Example 1. 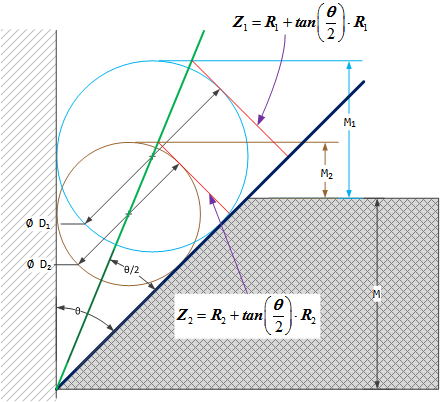 In my function evaluation, I use the fact that the gage ball diameter, D, is 1/2 the radius, R.
Figure 3: Derivation of Equation 1 and Application to Figure 1 Example. This is a relatively simple formula that is useful for precision angle measurement of a chamfer angle using two gage balls or roller gages of different diameter. I am Howie Moore and I will like to know if you have Chamfer Gages.if yes,then get back to me with the types and prices and the major credit cards you accept.Thank You.